A recursive server is the first step of all Internet activity, as it begins and ends the DNS resolution process that directs users to the resources they seek online. However, recursive servers have generally been left to Internet Service Providers (ISPs) to maintain and upgrade on a ‘best efforts’ basis, which leads to slow response times and occasional failures. 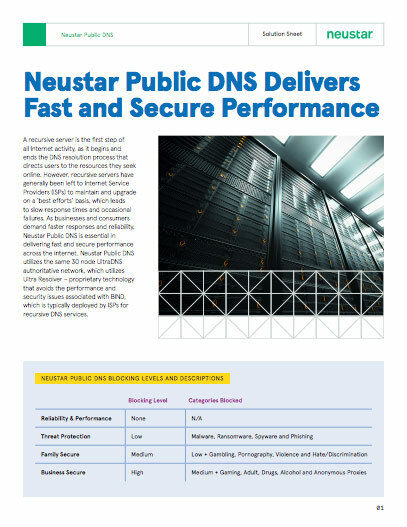 As businesses and consumers demand faster responses and reliability, Neustar Public DNS is essential in delivering fast and secure performance across the internet. Public DNS utilizes the same 30 node UltraDNS authoritative network, which utilizes Ultra Resolver – proprietary technology that avoids the performance and security issues associated with BIND, which is typically deployed by ISPs for recursive DNS services. For users who want protection against malicious domains for security purposes. For families that want to ensure children don’t have access to mature content. For businesses that want to ensure employee productivity by blocking unwanted and time-wasting content.